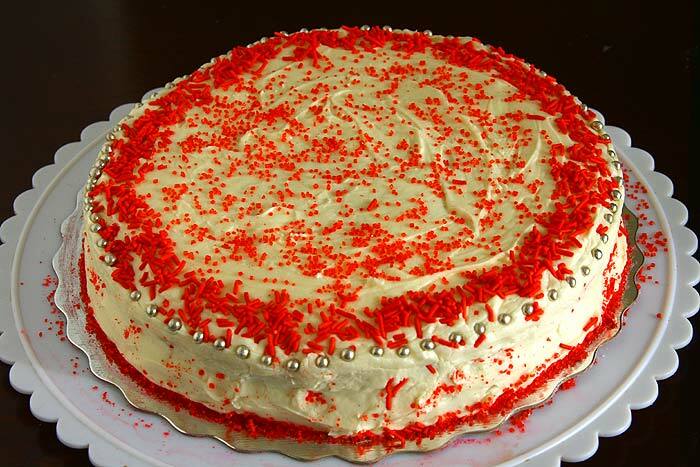 I made this eggless red velvet cake with cream cheese frosting for my youngest son’s 8th birthday upon his request. I don’t know why he was so hung up on red velvet cake! I already have a vegan red velvet cupcake recipe in the blog but decided to try a different recipe. 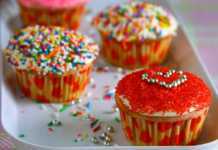 When I baked that cupcake, one thing I noticed was that I had to use a lot of red food coloring. If I remember right I think I emptied one whole bottle or at least close to it. That’s why I later tried a vegan chocolate cake using beet puree to make a safer red velvet cake but it turned out more of a purple color but no complaints about the taste whatsoever. This time around I thought I will buy a red velvet cake mix and make the cake thinking I don’t have to pour a bottle of red food coloring. I know it doesn’t sound logical because God knows how much food color and chemicals would have been used in the store-bought cake mix! But at that moment it felt okay to me. I went to the store and found an all natural red velvet cake mix. I read the ingredients and it looked all good, didn’t have all those long lists of unpronounceable chemical names, but one ingredient stopped me from buying the mix. Do you know what it was? It was cochineal/carmine, the source of the “all natural” red color. For those who aren’t aware natural red dye is derived from female cochineal bugs. It’s being used in a lot of food products which we might have eaten unknowingly but the thought of buying the cake mix with the knowledge creeped me out. Read more about this here. Sometimes I prefer to choose artificial over natural! Then went to the nearby bulk store and found their own red velvet cake mix which had artificial red coloring. The ingredients were also not too bad. I followed the instructions for the cake from that website and tweaked it a bit to make it egg free. 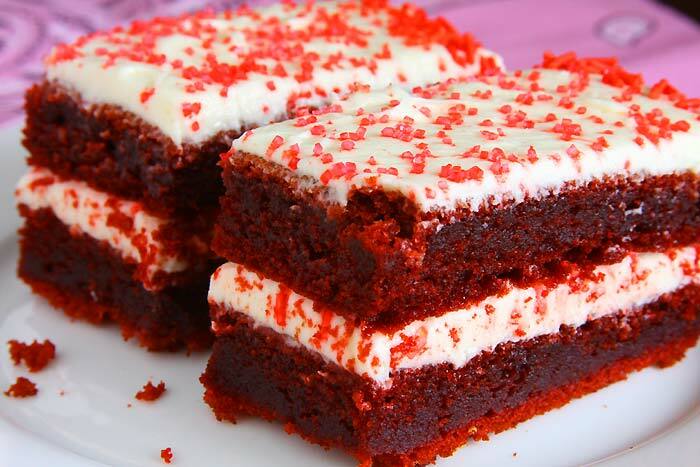 How To Make Eggless Red Velvet Cake? 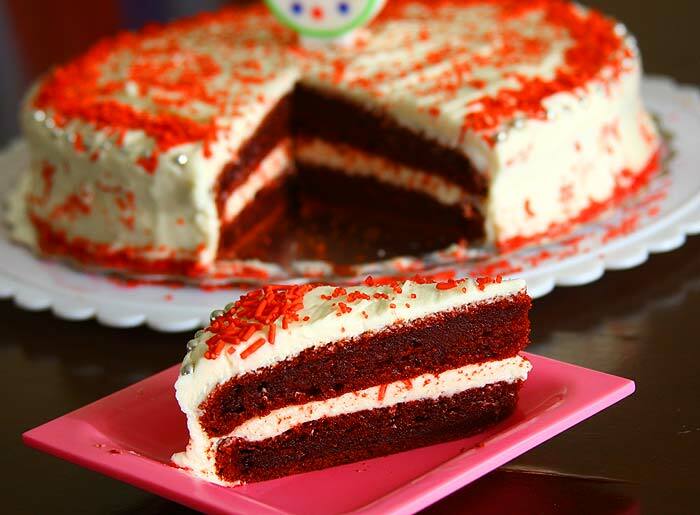 Here is an infographic on how to make an eggless red-velvet cake with step-by-step instructions. 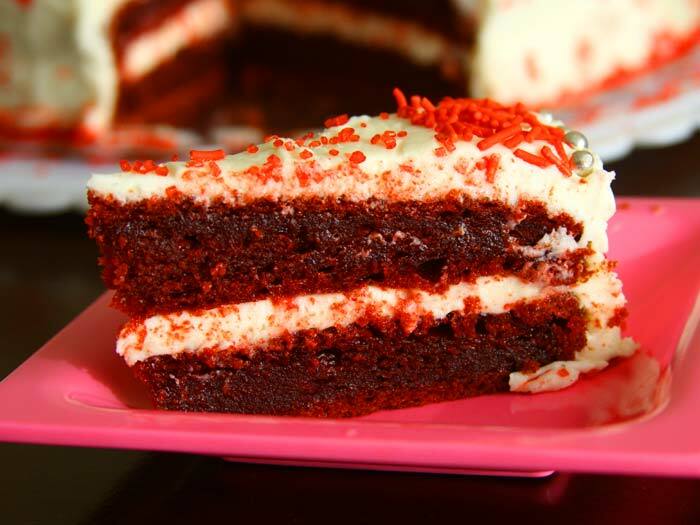 Making this egg free red velvet cake with cream cheese frosting is very easy because it starts with a store-bought cake mix but tastes like it was made from scratch. 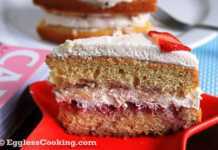 The combination of tofu and yogurt as egg substitute works like a charm making the cake very soft and moist. Preheat oven to 350F/180C. Line two 9 inch pans with parchment paper and grease lightly with non-stick cooking spray and set aside. In a large bowl add all the ingredients and mix for 1 minute on low speed. Scrape down the sides of the bowl and mix for 4 minutes on medium speed again. Divide the batter into the prepared pans and bake for 35-40 minutes or until a toothpick inserted in the center of the cake comes out clean. In a large bowl add the butter and cream cheese and beat until light and creamy. Add confectioner’s sugar and vanilla to the creamed mixture and beat well. The frosting is ready. 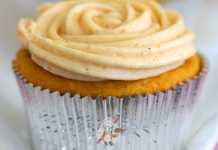 Start with 3 cups of sugar and increase gradually depending on the taste and texture. Please follow the step by step instructions in this eggless chocolate cake recipe to know how to frost a cake. This eggless red velvet cake was super soft and moist. The tofu and yogurt combination for egg substitute has once again proved to be the best, especially for cakes. Sometimes I don’t get neat slices when I cut the cakes I bake but this was truly an exception. I was able to make perfect slices like a pro. Everyone at the party loved the cake and kept asking for more and the whole cake was gone in a jiffy. I recommend using two 8-inch pans if you want your cake to look a bit taller.